23rd January. 30 days Santiago to Santiago via Ushuaia…“Fin del Mondo” Tour. After the Dakar has finished, Greg will be repositioning vehicles back across the Andes to Santiago to prepare for the next 4×4 self-drive adventure. Spectacular Southern Chile and Argentina. This tour will be comparable to the self-drive that took place in January 2016. Starting in Santiago, driving down to Ushuaia. Our itinerary takes in the very best of Argentina and Chile, zig-zagging in and out of Chile and Argentina all the way to the southernmost tip of South America or at least as far as you can drive. Once we have reached the end of the road we head for the port town of Puerto Natales and take a ferry boat to Puerto Montt. This this is a 3 night/4-day cruise through the fiords and channels of the Chilean coast. Spectacular!! The boat is a similar size to our own Cook Straight Ferries running between the North and South islands of New Zealand. 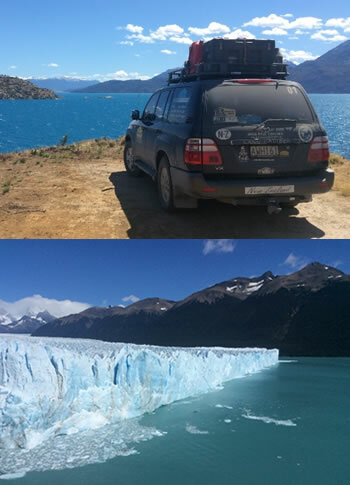 This “fin del Mondo” (road to the end of the world) tour is costed with Land Cruiser hire included. If you want to ship your own vehicle to Santiago that is ok and the cost will be adjusted accordingly. South America is now a popular and safe destination. Experience it with Overland Journeys before it becomes too popular and the costs escalate. We are taking expressions of interest now for the 2018 tour and have just 5 vehicles available for hire.